Car crash. Murder. Disease outbreak. War... Glad I’ve got your attention. Studies have shown that we are more attracted to negative headlines than positive ones, but could this actually be a good thing? So which would you like to hear first, the good news or the bad news? Well, apparently for most of us it’s an easy choice, and the bad news comes out on top. A 2014 study by Outbrain found that negative superlatives like "bad," "worst," and "never" work 30 percent better at catching our attention than positive ones like "always" or "best." In the study, the average click-through rate on headlines with these negative superlatives was a staggering 63 percent higher than those with their positive counterparts. So why are we all suckers for bad news? The report "News, Politics, and Negativity," points to the evolutionary benefits. After recording the physiological responses, sweat output and heart rate of people watching news footage, the study found that negative news stories grabbed attention and provoked a strong reaction, whereas the positive news stories had almost zero response. This can be expected: responding to stimuli that might represent danger is a survival skill and, in a world saturated with information, we need to be able to separate the important stuff from the fluff. One particular newspaper found out about the public appetite for bad news the hard way. A Russian-based publication reported only good news for an entire day and put a positive spin on all of their stories, such as "No disruption on the roads despite the snow." The result? The paper lost two-thirds of their readership in a single day. Bad news sells. Good news, not so much. The media’s taste for emphasising bad news — following the old saying "If it bleeds, it leads" — paints a bit of a depressing picture of humanity, but there’s more to it than a human desire for disaster. Newspapers don’t just exist to maximise profits; the function of media in a democracy is to expose corrupt governments and crimes which, unsurprisingly, tend to come in the shape of bad news. At the same time, behind every headline, there are the people and charities working to solve the world’s problems that get splashed on the front page. Bad things mean good causes and it’s often in the darkest moments that we see the best of humanity, like the rushes of volunteers who come forward in the wake of disasters. 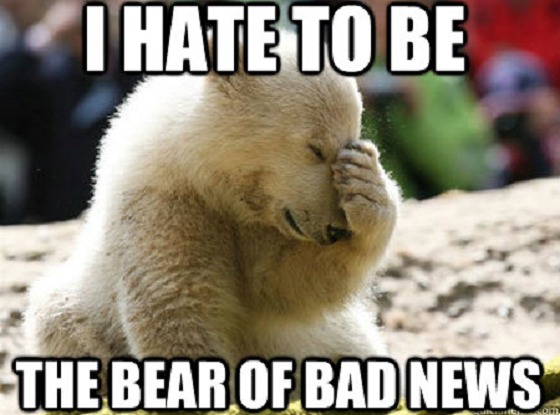 Bad news has its benefits and reports of daily injustices prompt people into positive action. If we had a constant stream of good news would we grow complacent? Even ignorant? We’re not likely to find out any time soon since our appetite for negative headlines remains as strong as ever, but the good news is— that phenomenon is not so bad.